The fear of rejection stops most people in their tracks. I mean the greatest fear in the world is public speaking and that is nothing more than the fear of rejection. So, it’s a human and natural fear. Overcoming that fear has a million roads. 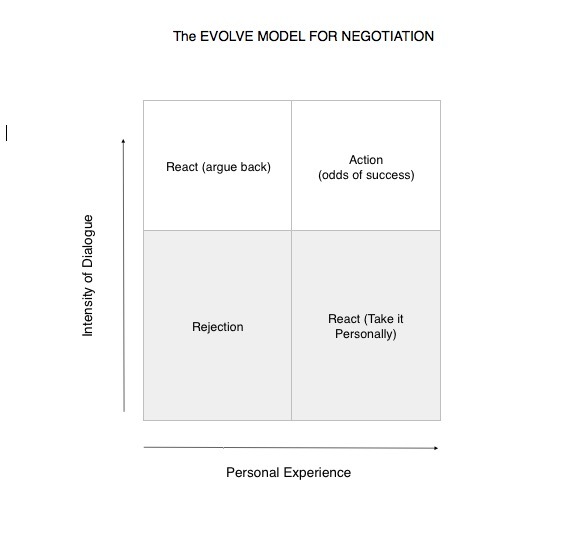 But most of those end up without the sale or without the success in negotiation. I’d like to present a variation based on Inspired Thinking. There are two tangents you can go on in a negotiation when you feel a sense or even a possibility of rejection and those two tangents do not add to the probability of success. The first is to take the rejection personally and come from that space. The second is to not take the rejection personally and argue back. Both trigger the fight flight response and mean that you are operating from a GOT TO space. (your lowest and least inspired part of your brain). When I challenge people in the 30 Day programme at first they take one of those two routes. Either they shut down and get pissed off inside thinking I can’t feel it and therefore don’t know it. Or, they argue back and accuse me of some terrible crime against their good character. It’s so boring and in the end, time wasting. When you have a sense of purpose, and you get a rejection, you can immediately jump in the Walker copter and rise up above the rejection and keep your corpus collosum fired up. (that’s the love to part of your brain that is inspired). The Walker Copter is fuelled by a sense of purpose. You can’t rise above something without that fuel. This third option keeps you authentic, non reactive but at the same time includes a sense of personal experience and a desire to continue in the conversation. Action rather than reaction. If the punch that comes – the rejection – is severe you may find yourself in a reactive space but unable to shift to action. In this case you would stop. Walk away. Do an emotional shower. Clear your head. Step back into the dialogue. By doing this you raise the probability of conversion of a sale, winning a negotiation, selling your services or romancing your partner. If you’d love to know more about this, it is an integral part of my 30 day challenge – learning inspired thinking.